Bowyer started 25thand finished 21st. Twenty-five laps into the race, Bowyer said his No. 14 ITsavvy Ford Fusion was “loose in and off the corner”. Despite trying different lines around the track to help his car, it was to no avail. “I can’t run high because I can’t cut down,” said Bowyer on lap 44 while running 20th. This handling condition persisted through the end of the stage, where a scheduled, four-tire pit stop was welcome. Bowyer pitted at the end of the stage for four tires and fuel along with significant tire pressure and wedge adjustments. Bowyer started 22ndand finished 19th. Running 19thon lap 127, Bowyer keyed his mic to say his ITsavvy Ford was starting to get tight in the center of the corner. Bowyer made a scheduled, green-flag pit stop on lap 157 for four tires, fuel and a right-rear wedge adjustment. This dropped him to 22ndand put him one lap down. Those fresh tires, however, allowed Bowyer to track down the leader and pass him just before the stage ended, earning his lap back. Bowyer pitted for four tires and fuel at the end of the stage, with specific adjustments to the right rear, which included inserting a spring rubber, more wedge and air pressure. Bowyer started 19thand finished 10th. By lap 230, Bowyer had climbed to 15thand declared that his ITsavvy Ford was “three times better” than it had been. Bowyer made a scheduled, green-flag pit stop on lap 267 for four tires and fuel. Came in 14thand returned to the track in 13th. Shod on four fresh Goodyears, Bowyer cracked the top-10 on lap 275. Martin Truex Jr., winner of Stage 1 and Stage 2, came from the back of the back to pass Bowyer for 10thon lap 293. As lap 300 ticked off the board, Bowyer radioed to crew chief Mike Bugarewicz, “really loose” as he fell to 12th. “Loose in and off,” said Bowyer about his ITsavvy Ford on lap 322 while running 11th. Bowyer took advantage of a caution period and pitted on lap 328 for four tires and fuel with a left-rear wedge adjustment. Restarted in 12thon lap 334 and continued in this spot with 50 laps to go. He was able to track down 11th-place Alex Bowman on lap 362 and then grab 10thplace from Erik Jones on lap 387. Bowyer waged a spirited battle with Brad Keselowski for ninth on the final lap, but Keselowski ultimately prevailed. This was Bowyer’s 13thtop-10 of 2018 and his 14thtop-10 in 26 career Monster Energy NASCAR Cup Series starts at Richmond. Kyle Busch won the Federated Auto Parts 400 to score his 50thcareer Monster Energy NASCAR Cup Series victory, his seventh of the season and his sixth at Richmond. His margin of victory over second-place Kevin Harvick was .777 of a second. There were three caution periods for a total of 23 laps. 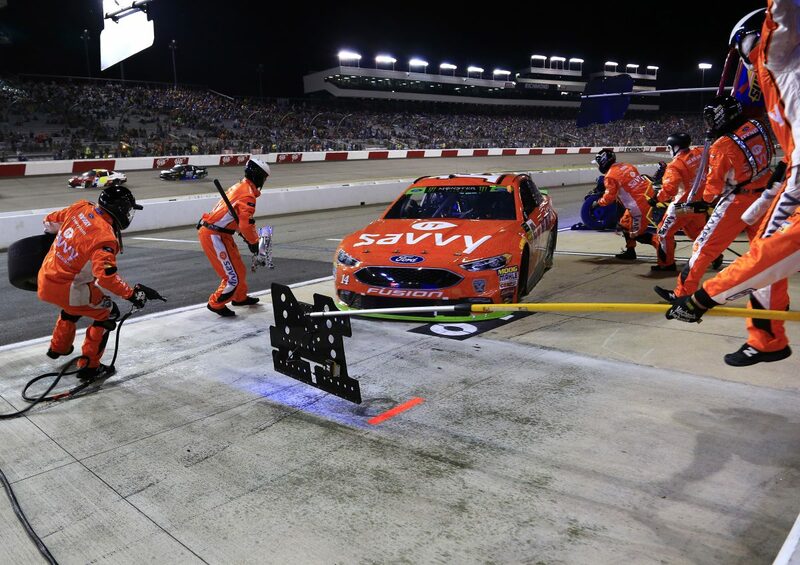 Only 13 of the 40 drivers in the Federated Auto Parts 400 finished on the lead lap. The next event on the Monster Energy NASCAR Cup Series schedule is the Bank of America Roval 400 on Sunday, Sept. 30 at Charlotte (N.C.) Motor Speedway. It is the third race of the 10-race playoffs and the cutoff race for the Round of 12. It starts at 2 p.m. EDT with live coverage provided by NBC beginning at 1 p.m.